On April 13, 2015 American Federation of Teachers president Randi Weingarten appeared on the Tavis Smiley show to have a conversation about the state of public education in the United States. American Federation of Teachers (AFT) President Randi Weingarten and Tavis Smiley.In the course of the conversation (14:20 minutes into the video), Tavis Smiley relates a meeting that he had with high school students in Detroit and how he was struck at how all of the students �do not buy into teaching to the test� and saw standardized tests as detrimental to their education. Randi Weingarten responded (15:42) that schools need more hands on engagement such as happens at some Career/Tech Education schools. She said there should be multiple assessments for students to demonstrate learning. However, embedded in her flowery talk about the need for multiple assessments, later in the interview, she supports the Senate version of the revised Education and Secondary Education Act (ESEA) that calls for annual testing. The reason she gives that annual testing is needed (21:14) is that �civil rights leaders� say we need the tests so kids from low-income families �are not invisible�. Weingarten also says the ESEA rewrite adopted by the Senate education committee and now going to debate in the full Senate says equity must be part of how schools are funded, but she is OK with leaving this up to the states, which is a guarantee of inequity because it depends on where you live. It may also be an attempt to defuse the Opt Out movement which will have to deal with each states different sets of standardized testing standards, which could splinter the national Opt Out movement into fifty pieces. This makes it all the more important that the Opt Out movement reject Weingarten�s endorsement of annual testing and unite around a policy of no standardized testing of any sort to rank students, teachers and schools. When Randi Weingarten came to Chicago on April 1, 2015, she made sure that she didn't have to take any questions from the 800 members of the Chicago Teachers Union House of Delegates. Above, Weingarten spoke to the delegates (she couldn't be in town and ignore the union meeting), but then ran out of the meeting without taking questions, telling the delegates she had to rush to the airport so she would be able to get back home. Substance photo by Sharon Schmidt. Weingarten does not address Tavis Smiley�s question about students being opposed to standardized tests because they are of no benefit to their education. She does not mention in the conversation the burgeoning Opt Out movement. Nor does she disclose that she has been working for years with The Gates Foundation and The Broad Foundation to create a teacher evaluation system based on standardized test scores. The depth of her involvement with corporate education reform was revealed on February 5th, 2015 at a conference of the right-wing American Enterprise Institute. At the conference the paper �Singing from the Same Hymnbook�: Education Policy Advocacy at Gates and Broad� was discussed. The paper revealed (page 16 and 17) that between 2000-2012, Weingarten testified three times with corporate education reformers about their attempt to create a teacher evaluation system based on standardized tests. "Overall, a pattern emerged wherein Gates and Broad increased advocacy grant funding to groups that gave frequent testimony � defined as three or more appearances before Congress from 2000 to 2012. Advocacy grant dollars to these groups grew by more than $12 million from 2005 to 2010 � well above the overall growth in funding for national advocacy groups. "As part of this group, up until 2013 (when an outcry from AFT members caused the AFT leadership to say they supposedly would no longer take money from The Gates Foundation), the AFT was given $11,343,925 by The Gates Foundation." Earlier in the conversation on his show (10:15), Tavis Smiley asked Randi Weingarten about the involvement of hedge fund managers, Bill Gates, and Eli Broad in public education. Weingarten responded (11:20) that due to one of the worst recessions since the Great Depression, school-systems, especially urban and rural school-systems, were desperate for money and the �philanthropies� stepped in. Weingarten gives as a second reason for corporate �philanthropy�: "What Eli Broad, what Bill Gates, what others really believe, they really believe this, that the effort of a teacher is directly correlative to the success of the student. They really believe that, and that you can measure that by an English or Math test score. So if all you do is shake the teacher up than that student will do better." So once again, we have a slight of hand. What she presents as benevolent philanthropy is an embedded apologia for corporate education reform, that they mean well but they just misunderstand teaching and tests. What is actually happening to public education has all of the characteristics of a hostile takeover that are a constant churn in the corporate world. Even before the recession, the public schools were increasingly starved of resources to advance a corporate reform agenda of privatization of public education. The goal of privatization of public schools is to make taxpayer dollars available for corporate profit. Weingarten never acknowledges a hostile intent by corporate education reform, but presents them as well intentioned corporate entities looking out for the common good. Perhaps Weingarten�s steering the viewers of The Tavis Smiley Show away from this understanding can be attributed to her more than ten year collaboration with the Gates Foundation and The Broad Foundation. 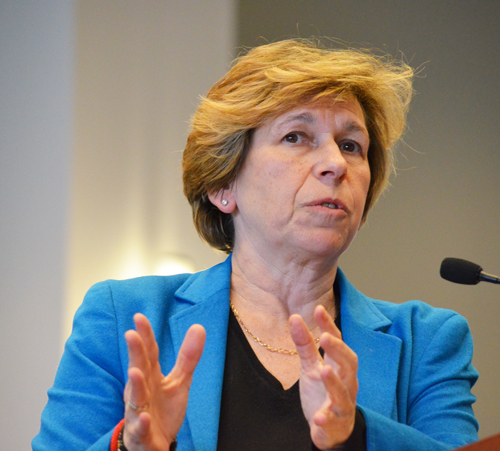 Weingarten�s method is to say in public (within limits) - on talk shows, in speaking to the corporate media, and to her loyal supporters in the AFT - what a teachers� union leader would be expected to say. The corporate media sees her as the go-to person for the teacher point of view. Behind the scenes, however, is another story hidden in plain sight, of the collaboration of the president of the AFT with corporate education reform. Turning �collaboration� Into a Bad Word | Defend Public Education! Is Corporate Education Reform Trying to Coopt the Opt Out movement? Defend Public Education! Talking to the Choir: AEI panels discuss their attack on public education | Defend Public Education! Which Side Are You On? | Defend Public Education! Links for this article can be found at Defend Public Education!